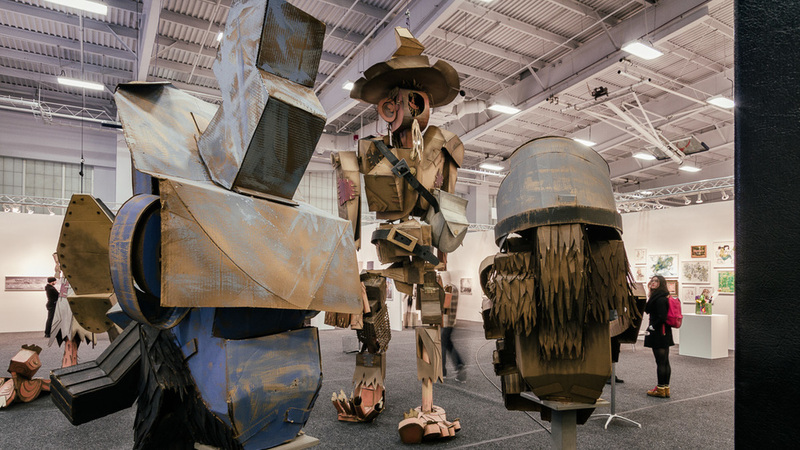 New York City, March 5, 2015; Wayne White’s “Cubist Cardboard Civil War Puppets” were originally created for an installation called “Foe” in York, Pennsylvania in 2014. This installation is about the invasion of York, Pennsylvania by rebel forces right before Gettysburg. The art pieces are representations of the Rag-tag confederate soldiers that looted the town for new shoes, food and other goods. 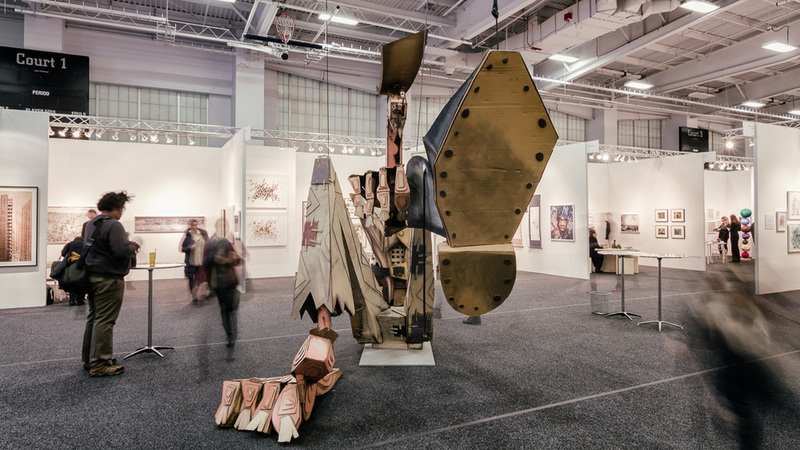 During the “Art on Paper” art fair, which took place this month in New York City on Pier 36, Mr. White showcased these art pieces. They are large and elaborate (with interactive movable parts) cardboard sculptures, the largest measuring approximately 20’ high by 30’ long. These cardboard sculptures were the heart of the fair, visible from various key locations within the complex. In addition to being a successful artist, Mr. White is a very kind and friendly person. On my way to the “Art on Paper” opening reception, right off the train, I walked into a snow blizzard. Visibility was low and it was difficult to see which direction to walk to the fair. I asked a few locals on the street, but some did not speak English and the ones that did had no idea what I was talking about. Mr. White was also on his way there, passed me and overheard the conversation. “Come with me I am walking there,” Mr. White said to me. It is winter, so, I could not possibly recognize him until he told me his name. Little did he know, I am a fan of his work and also a blogger. His personality and originality set him apart. To view additional photographs of this event please click HERE!